By offering the same stability during stacking operations from counterbalanced stackers, the PS 30RM can operate with the reach mast in tight spaces just as well. The powerful Noblelift AC drive technology combines top energy saving performance with easy maintenance. The powerful 270 Ah battery and the alternative 400 Ah battery offers excellent performance throughout the day. 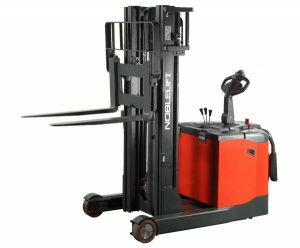 When the stacker requires a much stronger steering force, the Noblelift electric steering system offers effortless operability. The fork tilt allows for easier, safer pallet staging and handling. When long distance travel occurs, the foldable platform with protective arms is the best choice to handle goods more efficiently. The PS 13RM comes with a robust chassis ready for warehouse and loading/unloading operations. The larger support wheels ensure a longer life than smaller wheels on other trucks.